This time I want to share about PHP Codeigniter Tutorial for beginners. 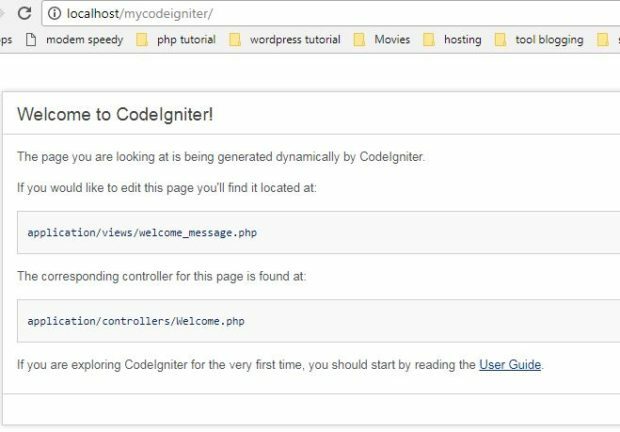 CodeIgniter is an open source PHP framework with MVC model (Model, View, Controller) for building dynamic websites with fast and efficient use. CodeIgniter makes it easy for developers to create web apps quickly and easily compared to making them from scratch. Frameworks is a collection of functions/procedures and classes for a particular purpose that is ready to be used so as to simplify and speed up a programmer’s work, without having to create a function or class from scratch. Accelerate and simplify the construction of a web application. Relatively easy in the maintenance process because there is already a particular pattern in a framework (provided that the programmer follows the existing standard pattern). Framework provides commonly used facilities so that we do not need to build from scratch (e.g., validation, ORM, pagination, multiple databases, scaffolding, session setting, error handling, etc.). Suitable for beginners: the use of CodeIgniter is effortless, this framework is perfect for beginners. High-speed performance: CodeIgniter is the fastest framework compared to other PHP frameworks. Minimal configuration (nearly zero configuration): Using standard configuration, CodeIgniter works well. For a large project, you only need to adjust to the database settings, routing or autoload. Many communities and forums: with this large CI community, make it easy for us to interact with others, whether it’s inquiring or the latest technology. Complete documentation: Every CodeIgniter installation package accompanied by an excellent and full user guide for starters, the language is easy to understand. I think installing CodeIgniter is pretty easy to use. This framework does not require too many complicated configurations. The first step is to download the latest version CodeIgniter on the official site codeigniter.com. After that extract the source code and change its name to mycodeigniter then move the folder to htdocs folder(c://xampp/htdocs/). In my example, I use XAMPP as PHP server. To test whether the installation process is successful or not, please access the URL http://localhost/ mycodeIgniter/. If successful it will appear Welcome to CodeIgniter as shown below. Done, Installing CodeIgniter does not require any complicated configuration. Thus my article about Introduction – PHP Codeigniter Tutorial For Dummies Step By Step. The next article i will share Codeigniter MVC Concept For Dummies With Simple Example, hope useful.